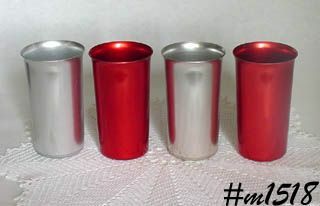 This listing has 4 vintage Sunburst aluminum tumblers! There are 2 silver color and two red color, measure 4 3/4" tall, and are marked Sunburst. Tumblers are in very good condition with minor "use" evidence, color on bottom. Sunburst aluminum items are rather difficult to find!